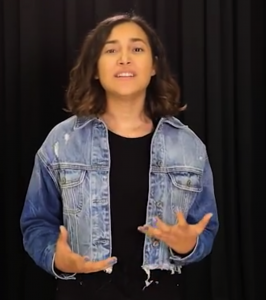 Latina Lista: News from the Latinx perspective > Immigration > What Do We Know About Immigrants with Temporary Protected Status? Temporary Protected Status (TPS) is a little-known program that offers a temporary legal status to certain immigrants in the United States who cannot return to their country of origin due to ongoing armed conflict, natural disaster, or other extraordinary reasons. Once the U.S. Department of Homeland Security (DHS) issues a TPS designation for nationals from such a country, applicants must prove they have continuously lived in the United States since a specific date and undergo a criminal and security background check. The secretary of Homeland Security can grant and renew TPS for periods of six to 18 months. At this point, TPS beneficiaries must apply for renewal, submit to additional background checks, and pay a fee. As the Trump administration works to systematically dismantle the U.S. immigrationsystem, over the past two years, it has ended TPS designations for 6 of the 10 countries. These six countries—El Salvador, Haiti, Honduras, Nepal, Nicaragua, and Sudan—represent 98 percent of the nearly 318,000 individuals currently protected under TPS. It also ended Deferred Enforcement Departure, a similar program, for certain Liberians in the United States. With these terminations, the lives of these individuals and their families were thrust in limbo. There are several lawsuits challenging these terminations in the courts. In October 2018, the Northern District Court of California issued a preliminary injunction, leaving the designations for Sudan, Nicaragua, Haiti, and El Salvador temporarily in place. This means that individuals with TPS from these four countries can maintain their protection from deportation and work authorization. 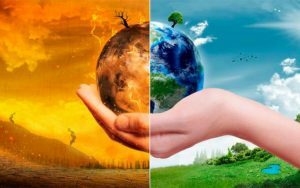 TPS holders from Honduras and Nepal are not included in this lawsuit, as it was filed prior to the Trump administration’s terminations for these two countries. Using new analysis techniques of the 2017 American Community Survey, this column highlights characteristics of TPS holders from El Salvador, Honduras, and Haiti—the three largest groups of TPS holders, representing 94 percent of all individuals. 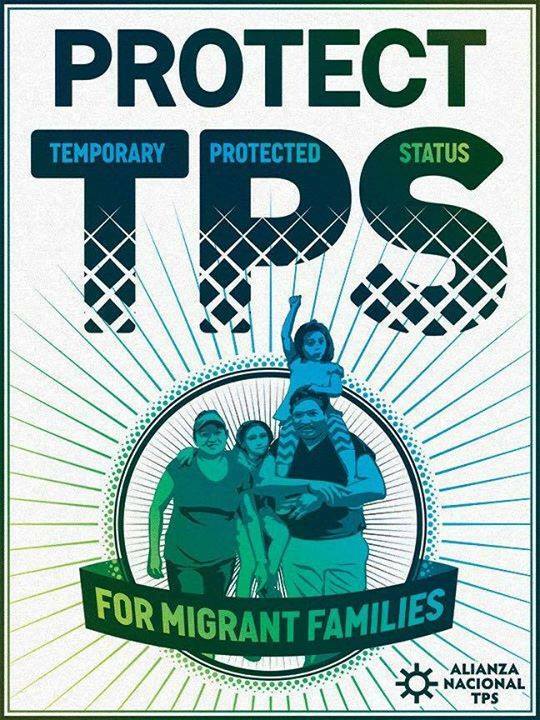 TPS offers protections to Salvadorans who have been in the country since February 2001; Hondurans who have been in the country since December 1998; and Haitians who have been in the country since January 2011. It is no surprise, then, that these individuals are deeply embedded community members. On average, Salvadorans with TPS have lived in the United States for 22 years, Hondurans for 23 years, and Haitians for 17 years. A notable share of these individuals were under the age of 18 when they arrived—between 29 percent and 32 percent for each of the three countries—illustrating that many have been in the United States for the entirety of their adult lives. Unsurprisingly, many long-time TPS holders have families in the United States. Approximately 620,000 individuals live in a household with a family member that TPS protects. That number includes 448,000 U.S. citizens, 279,000 of whom are U.S.-citizen children under the age of 18. * The end of TPS will directly affect these children, as they will either be separated from their parents or forced to relocate to a foreign country to which they may know nothing of. The ramifications these children would face—including emotional distress, economic insecurity, and developmental impacts—would be life altering. For more information on the harms facing these children, please see the accompanying fact sheet. Individuals with TPS live throughout the country. 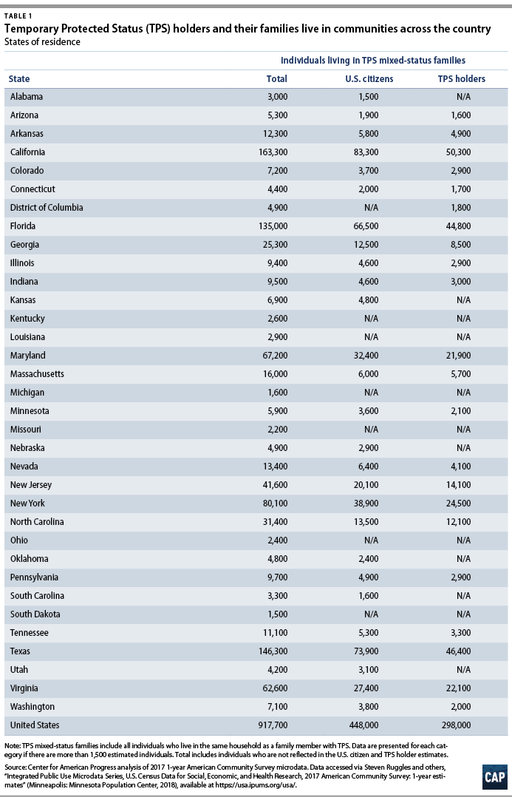 While states with traditionally large immigrant populations see similarly larger numbers of TPS beneficiaries, 21 states and the District of Columbia have at least 1,500 residents holding TPS. Beyond their inextricable links to their communities, the economy benefits in numerous ways from TPS holders. With a labor force participation rate of 87 percent, more than 246,000 TPS holders are working across the country. The largest occupation groups for these workers are building and grounds cleaning and maintenance occupations (48,000) and construction (44,000), with sizable numbers in crucial occupations related child care, personal care, and home health aides (9,300). Especially in states such as Texas, California, Florida, Virginia, and North Carolina, TPS holders working in construction are playing a large role in helping their communities recover from recent natural disasters. Additionally, the end of TPS will have repercussions that extend far beyond the individuals holding TPS and their families. All of these construction workers, healthcare workers, and child care providers would lose their work authorization on the same day that their status is revoked. In addition to their jobs, TPS holders buoy the economy with their earnings. 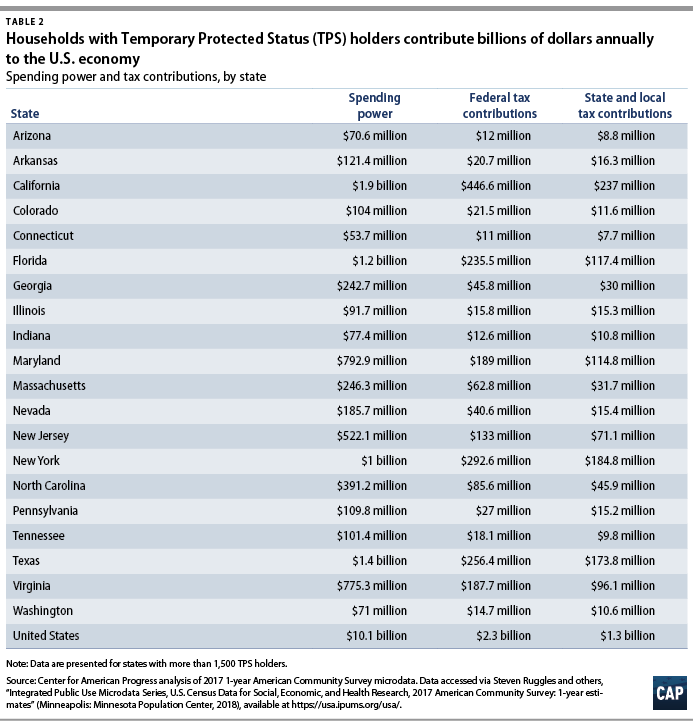 Households with TPS holders contribute $2.3 billion in federal taxes and $1.3 billion in state and local taxes annually. They hold more than $10.1 billion in spending power. On top of this, their employers contribute to Social Security and Medicare funding. About one-third of households with a TPS beneficiary have a mortgage, which would have a major impact on the housing market should TPS holders be forced to leave. For decades, the United States has provided protection to individuals unable to return to countries such as El Salvador, Honduras, and Haiti. These individuals have created lives for themselves in the United States. They have families and careers and have continually provided information the federal government requires in order maintain their status. Though some are currently protected from losing their status by virtue of a court decision, all are living with anxiety and uncertainty. They are being forced to contemplate an impossible choice on the horizon—return to countries they have not seen in a generation or remain undocumented in the United States. And for those with U.S.-citizen children, the decisions become even more difficult. Just as is the case with Dreamers, Congress must pass legislation offering a pathway to permanent protection and citizenship for individuals with TPS.